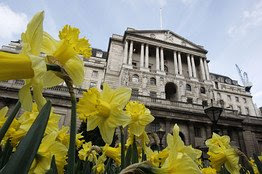 The Wall Street Journal reports that British bond auction fizzles. A U.K. auction of ordinary government bonds failed to draw enough bids to cover the amount on offer for the first time in more than a decade. The auction involved 40-year bonds, which typically see more problems with demand. Still, the poor auction result comes at a very difficult time for the gilts market, when investors and banks are trying to swallow record issuance of U.K. government debt. Bank of England Governor Mervyn King told a U.K. parliamentary committee Tuesday that the government needs to be "cautious" about further fiscal stimulus. Gilt futures have erased all price gains made since the Bank of England announced it would start buying bonds to boost the money supply. U.K. government debt and the pound both moved lower on the news, and gilt futures have now erased all their price gains made since the Bank of England announced March 5 that it would start buying bonds to boost the money supply. "Having flirted with a failed conventional auction twice over recent weeks, the market has finally witnessed one," said John Wraith, head of sterling rates at Royal Bank of Canada Capital Markets. The U.K.'s Debt Management Office had sought to sell 1.75 billion pounds ($2.56 billion) of 40-year gilts in a regularly scheduled auction. The government received bids for only 93% of the total amount on offer, compared with a cover of more than twice the amount on offer in an auction of 40-year bonds Feb. 4. "The risk of an uncovered auction is a normal part of the auction process," said Sarah Ellis, a DMO spokeswoman. The outcome is rare, however. The DMO said this was the first uncovered conventional gilt auction since 1995 when a 7.5% gilt, due 2006, received bids for 99% of the total amount on offer. There has, however, been a more recent uncovered index-linked gilt auction, in which a 2035 bond achieved a cover of only 0.95 in September 2002. The gilt market moved sharply. June gilts were down 1.00 on the day at 120.37, after a low of 119.45 made soon after the results were announced. Sterling slipped a little against the dollar and the euro. The DMO is due to issue 146.4 billion pounds of gilts in the current 2008-2009 financial year and 147.9 billion pounds in the 2009-2010 financial year, which starts April 5. The issue falls outside the maturity range of the Bank of England's gilt purchases which form part of its quantitative-easing program and involve buying government bonds between five and 25-years in maturity. Demand for issues in this band has risen since the program was announced. Auctions of long-dated gilts are traditionally more vulnerable to drops in demand, because they rely on buying by pension funds and insurance companies which is usually sporadic and linked to specific times when they want to hedge their liabilities. "Demand for gilts clearly remains strong and the small shortfall in funding today can be made good in future auctions [as long as more failed auctions don't start occuring]," the spokesman said. Other European countries have had uncovered government bond auctions this year as all governments are borrowing heavily to replace lost tax revenue, fund stimulus packages and rescue domestic banks. The German government has had two uncovered bond auctions t his year out of a total of five and experienced some uncovered sales last year as well [German citizens are the reason Germany has had more failed auctions than the UK despite having far stronger fundamentals. These citizens remember how, eighty years ago, hyperinflation made government bonds completely worthless, and so they are lot more nervous about buying them]. The auction Wednesday achieved a yield "tail," or the difference between the average and highest yields, which is a gauge of demand, of an exceptionally high 12.8 basis points, compared with 0.2 basis point at the previous tender. Mr. King spooked the market Tuesday by saying that the central bank wouldn't necessarily need to buy the full 75 billion pounds of gilts it first announced. That came on a day when consumer price inflation was shown to have risen in the year to February, raising questions about the extent of further quantitative easing required. "This is just adding to the negative sentiment (in gilts) which is equities rallying [Actually, the pound is falling. The stock price of companies with real assets goes up as the pound becomes more worthless], inflation coming out higher [Falling pound is driving up prices. Rising prices means higher inflation expectation, which means investors want higher yields on bond purchases], people have really long positions [There is another name for "really long positions". When everyone piles into one asset class, it is usually called a bubble]," said Mohit Kumar, a gilts strategist at Deutsche Bank AG in London. My reaction: The gilt market is a bubble which is beginning to burst. With the UK money supply expanding rapidly, inflation risks are skyrocketing, making owning low yielding government bonds a losing venture. As investors realize this, demand for UK bonds is disappearing. The UK is in serious trouble. 1) A UK auction of 40-year bonds failed to draw enough bids to cover the amount on offer. 2) The U.K.'s Debt Management Office had sought to sell 1.75 billion pounds ($2.56 billion) of 40-year gilts in a regularly scheduled auction, and the government received bids for only 93% of the total amount on offer. 3) This was the first uncovered gilt auction since 1995 when a gilt received bids for 99% of the total amount on offer. 4) The poor auction result comes at a time when investors and banks are trying to swallow record issuance of U.K. government debt. Bank of England Governor Mervyn King told a U.K. parliamentary committee Tuesday that the government needs to be "cautious" about further fiscal stimulus. 5) The issue falls outside the maturity range of the Bank of England's gilt purchases which involves buying government bonds between five and 25-years in maturity. B) Bank of England expands its purchases to 40-year bonds. Since the market price of longer term bonds is a lot more sensitive to changes in interest rates, this would expose the Bank of England to much greater losses. Second, this development highlights that the UK is losing its ability to fund itself through borrowing. Third, the UK's failed auction offers a preview of what is to come in the US. Very soon, treasury auctions will also begin to fail, forcing the fed to step up purchases to keep yields down. Finally, this development illustrates why the Bank of England and the fed will not be able to reverse their balance sheet expansions. With demand weakening, any attempt to sell government bonds purchased because of quantitative-easing programs would cause the market to completely collapse. 2) Britain's rapidly expanding monetary base raises inflation fears . 5) This cause the expansion of the monetary base to accelerate. This entry was posted in Currency_Collapse, News_Developments. Bookmark the permalink. Perhaps the buyers were there, but the sellers refused to sell at the low bid? This "failure" is clearly based on a strong expectation of deflation, not inflation, in the coming quarters and years. The USD is the best investment vehicle to have in the near-to-intermediate term. Metals should fall sharply from here. Can you explain your logic? Mish if the expectation was deflation then people would be piling into treasuries, since real rates would be very positive. Keith you are wrong. Have you seen the recent 5 year results? Also have you heard the words of the Treasury Secretary who appears to be considering the Chinese proposal to cut the USD loose? I didn't think so. That would certainly describe what we saw as the RE then stock market first tumbled in deflation. Have you guys read this stuff on planetx over at meltdown2011 (was just posted yesterday)? All this financial panic could be a smokescreen to keep us all occupied. Read all the links and then decide for yourself----could it be true? OOOOOOOOOOK! This is a positive feedback loop. Because they expect deflation they won't buy it because of fear of default. That's how I understood Mike (Mish) Shedlock. But Mike is terrible wrong that UK is in deflation. Does he read news from UK? Deflation fear is different from a debt default fear. The UK and the US is in deflation. Seen how much credit has been destroyed? Wouldn't deflation make a bond issue more successful? If money supply shrinks the tickets can purchase more stuff... Since the governments can print as many tickets as they want aren't you virtually guaranteed to get your principal back with whatever interest you get? And if you save all that interest you have more purchasing power ? I would think that bond failures happen due to the expectation that the bonds will be worthless in the future, not more valuable. what is the difference between credit destroyed and non-issuance of credit? What credit has been destroyed? The CDS (bets) that were never backed by any collateral of value? Or are you talking about erasing numbers on an accounting page that never should have been there in the first place? That's what I like about this so-called capitalism. Let's make it so complicated and opaque that no one can truly assess the difference between an anomalie and a fraud. I'm trying to understand the 3 theories here of Deflation, Inflation and Hyperinflation. The Deflationist says that we are experiencing deflation because the money supply(credit + Base Money) is decreasing and believes the price of things are or will be falling. The inflationist says that all this new base money being printed with bailouts is in fact inflation and that this new money is or will cause prices to things to rise. The hyperinflationist says that this great credit contraction is hyperinflation and that prices of things is or will rise. I'm in the hyperinflationist camp and the thing the deflationist and inflationist seem to get confused on ironically is the credit contraction. The inflationists seem to ignore the enormous size of the credit contraction that is preventing banks from loaning out money. So the new money that is being printed which they say will cause prices to rise is not circulating. The deflationists although aware of the great credit contraction seem to ignore how this great credit contraction will cause a great decrease in supplies of things and a great increase in borrowing/production costs. So both the inflationists and deflationists are missing what this great credit contraction means for prices. The hyperinflationist recognizes that this great credit contraction is infact hyperinflation as the value of debt is being destroyed. The last form of debt to be destroyed will be US Treasuries and not because of printing new Federal Reserve Notes but because the credit contraction is so large that borrowing/production costs will have to be passed on to consumers, causing prices to rise on everything to the tune of how much is needed to cover borrowing costs. And considering the size of this credit contraction, borrowing costs is and will be rising high. The govt. is doing everything they can to slow and stop this credit contraction but this is the same thing that happened in Weimer Germany. This credit contraction is just starting and soon it will be roaring further and greater, too great for the Fed's printing press of a $100 bills to stop defaults and like Weimer larger denominated bills will have to be created or we'll face massive defaults. I for one believe the credit contraction is so large that even with massive weimer style printing we'll still face defaults. But point is this massive credit contraction and defaults will cause a huge drop in supply of things and a huge rise in prices of things. Basic supply and demand would seem to dictate that if demand for gilts is too low, then one would need to raise the interest rate to attract more investors. Seems like a simple concept, am I missing something? Why would they not raise interest rates if the evidence is right there in front of them? "Two weeks ago, when Britain started monetizes its national debt, it created a negative feedback loop which will ultimately destroy the pound and decimate the UK"
Maybe you mistyped? It is positive feedback that leads to system instability. Negative feedback stabilizes system. "Basic supply and demand would seem to dictate that if demand for gilts is too low, then one would need to raise the interest rate to attract more investors. Seems like a simple concept, am I missing something? Why would they not raise interest rates if the evidence is right there in front of them?" Why would they not raise interest rates? Because they don't need to. In fact they need to lower interest rates. There is a shortage of the currency. Having them raise interest rates is like having these cash strapped companies lower prices, they can't and if they do they default and go out of business. If they raise interest rates there will be massive defaults. They want to avoid defaults. The thing is even if they adopted and maintained a ZIRP the debt deleveraging is so large the amount of printing they are capable of at current currency denominated cap levels is not enough to stop defaults. And because of this enourmous credit contraction borrowing/production costs will go through the roof. Companies have to get that money from somewhere, if they choose to keep prices too low, they won't make enough to cover borrowing/production costs and they will go out of business. But incomes are too low to meet the prices companies need to cover borrowing costs so allot of companies will go out of business(unemployment will continue to rise). The only way to stop this is by slowing the credit contraction but the only way to slow the credit contraction is by printing larger bills because at current levels the bills are too small to stop the enormous credit contraction. But point is the LESS they print the MORE prices on things not debt will rise. Inflationists have it backwards and Deflationists ignore borrowing/production costs. The time to raise interest rates will be after all or most of the debt has finished deleveraging (which will be after there are Zimbabwe size bills) and the truth is we are just getting started with this deleveraging. Currency will be destroyed as well as the system as the system can not work without the currency but the system would be destroyed if they stopped printing and allowed defaults as trust in the system would be lost and the system can not run without trust. Would you let me hold your money again if I lost it the last time you let me hold it, especially if I not only lost your money but hundreds of millions of other people's money, giving me a reputation for loosing people's money? I didn't think so. Also ask yourself how much would you charge me to hold your money if you knew there was a great chance of me loosing your money? Alot right? Also ask yourself how much the government and the people rely on borrowing? Alot right? So you see where this is going. The death of the system was inevitable from the start and bailouts give the system a slow death as apposed to defaulting which would give the system a quick death. And they only care about keeping the system alive for as long as they can. Unfortunately for them, the time is near for death and they are using up their last tools to keep the system alive. And because these last tools are not enough to stop the credit contraction and defaults borrowing costs will rise exponentially being passed on to consumers. Consumer prices will rise more and more after the credit market takes another big hit which the govt. will not be able to print it's way out of. Larger bills being printed is a pathetic attempt by the govt. to stop this from happening but the credit contraction is so large that these larger bills will do nothing to stop the credit contraction. The inflationists will confuse the rise in price as an effect of the new larger bills when the opposite is the truth. The rise in price is the cause of the new larger bills not the effect. The cause for the rise in price has already happened(the enormous debt), we are just waiting for the effect to take place. The deflationists will be confused as we experience rising prices along with rising unemployement, falling home prices, falling bond yields, rising commodity prices, Falling stock market, Banks hoarding cash, Negative GDP and, rising bank failures. Dealers buy U.S. government paper and quickly sell it back. The big banks and brokerage houses that deal directly with the Federal Reserve were avid buyers of Treasury securities in auctions last week, but they were even more avid sellers of those bonds to the central bank. "What appears to be happening is the 16 primary dealers that were responsible for helping underwrite the auctions are now long with the hope of quickly selling the bonds at a higher price to the Fed before the next supply infusion comes in a few weeks," said Josh Stiles, senior bond strategist at IDEAglobal.